Welcome to Marvel Strike Force Heroes page. This is the full description of MSF Luke Cage stats, skills and abilities. Luke Cage is a Defender Protector who can buff his allies with Defense up. His first skill delivers a high amount of damage and has a chance to grant assistance to Luke Cage from the Hero ally. His second skill is Taunt which is enhanced by Regenerate and lasts 2 rounds. Luke Cage ultimate buffs whole team with the Defense Up and grants one or two ability energy to the random ally. In addition, Luke Cage gains Deathproof as well. His passive ability grants him additional health and armor. Luke Cage is your first Protector and he is available immediately after Spider-Man joins your team. After Defenders Update, Luce Cage can buff his DEFENDER allies for 2 turns instead one, and his abilities are enhanced. Luke Cage shards can be obtained via Mega Orbs, Premium Orbs, Blitz Orbs, Blitz Supplies, and 3-3 Heroic Assembly campaign mission. 30% chance to apply Assist Now to a random HERO ally. Attack primary target for 100% damage. Apply Defense Up to all allies. What are Luke Cage's stats? 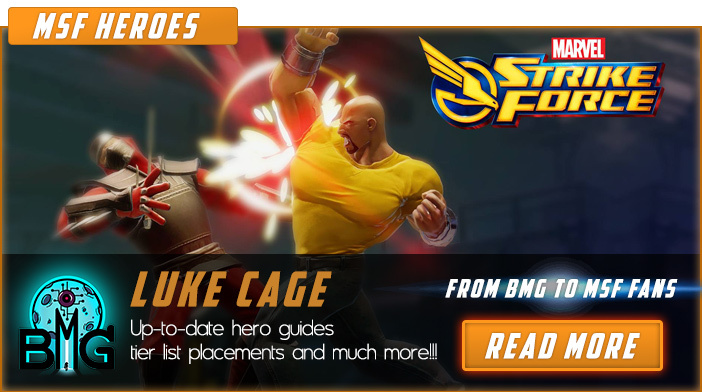 We hope that you enjoyed the description of MSF Hero Luke Cage. For detailed information about other MSF Characters check our MSF Heroes page.